We’re on the grounds of El Cosmico approaching the Border Patrol fence. Twelve foot high fence with a lot of barbed wire on the top. That’s Liz Lambert, the owner of El Cosmico, looking out at her neighbor. The saying is true in West Texas as it is anywhere. And this is a good fence. Twice the height of a human, strung with razor-sharp concertina wire, and monitored by 24-hour video surveillance. U.S Customs and Border Protection is one of the largest businesses in town. And El Cosmico, that’s….ahhh how do you describe it? El Cosmico is, a sort of, alternative campground, lodging experience. Yurts, tents, teepees, hot tubs, hammocks, and vintage trailers. 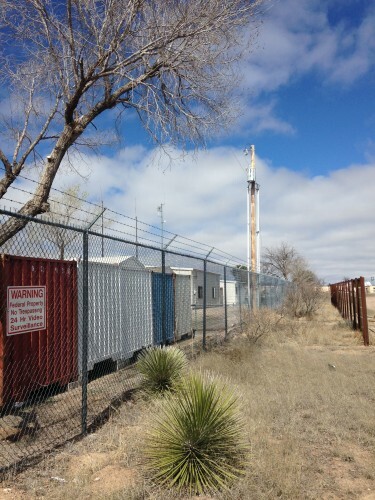 This fence line, which runs a few city blocks, sums up the split personality of West Texas, and especially of Marfa. You couldn’t pick two more different neighbors, I don’t think. 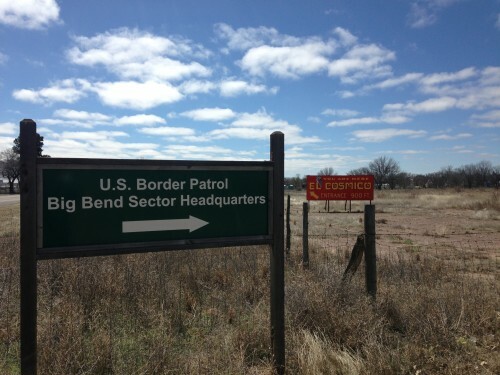 And so it’s funny it says something about West Texas that this like hippie campground and the federal border patrol can actually be next to each other and consider ourselves good neighbors. Particularly since they fired into El Cosmico, not too long ago. That was really, you know, that was more than borrowing a cup of sugar. It was August 25th and the hotel and campground was at full capacity. Biff Bolen is the facilities manager there. From my understanding they were in a gun safety training class, in a classroom. It was discharged from this room here. You can see actually the hole right in between the two windows. Judging by where the gun went off, by the hole in the way, they could determine, they were concerned that it went into one of our trailers. Bolen: “But it was the summer, so there were a lot of people hanging out. If you look right past the trailer you can see the hammocks over there. There were tons of people over there. So we had to check every trailer and make sure. “I mean, it’s an unfortunate incident,” says Bill Brooks is an official for the Border Patrol. “It’s something that happens occasionally,” says Brooks. “I think they should have sent me a card,” says Lambert. But it worked out. Or …. you can build another fence. You see the fence that we started building. We have to be 10 feet away from their fence. It’s a cedar fence. And we started planting these Afghan Pines. Every time we get some extra money, we put more trees in so that we can start to block the lights. And lights is one of their less-dangerous disputes. Lambert: It’s a problem for us because part of the experience of El Cosmico is to be able to look at the night sky, but we have a tremendous amount of light pollution from the border patrol. Brooks: The light was designed. It’s security lighting for the fence systems. Lambert: We’ve been working on it for years. We’ve had a little bit of success in having a couple of guys climb up onto the roof to shade the lights. Brooks: We just moved some lights a little. We just adjusted some lights a little. On one side, you’ve got a neighbor who wants to keep it in the dark. On the other, a neighbor whose trained to shine a light on the shadows. Lambert: I’ve always wondered. You know they certainly get a an eyeful from the Dutch tubs, where people take their clothes off and jump in to wood-fired hot tubs. I’m sure they smell all sorts of things over here. I wonder if they’re happy that we moved in next door, so that they have something to look at. Brooks: I have to be honest that I think that it’s lot more intriguing then having a pasture with a couple of horses in it. Which it used to be. Lambert: When I bought this property, there were plans for the border patrol to move to the other side of town, but the proposed move never happened. So we’ve been good neighbors ever since. Brooks: Maybe we should spend more time together, I guess (laughs). It’s a line – marked by a fence – and there, you’ve got two very different West Texas neighbors, getting along.